Jerome Powell is a new kind of Fed Chairman for a new time in American history. As President Trump has bulldozed norms of presidential behavior, Powell has gone about changing the nature of the Fed's relationship with Wall Street, Congress and Main Street. What it means: Powell has clearly set his sights on changing the public's perception of the Fed from a faceless private bank that upholds the interests of corporate America to a source of economic growth that supports job creation. Win friends in Washington by taking 4 times as many meetings with Congressional lawmakers as his predecessor. Remove the target from the Fed's back and shore up support on Wall Street by emphasizing "data dependence" rather than a pre-determined rate hike path. Appeal to the public with speeches and television appearances. 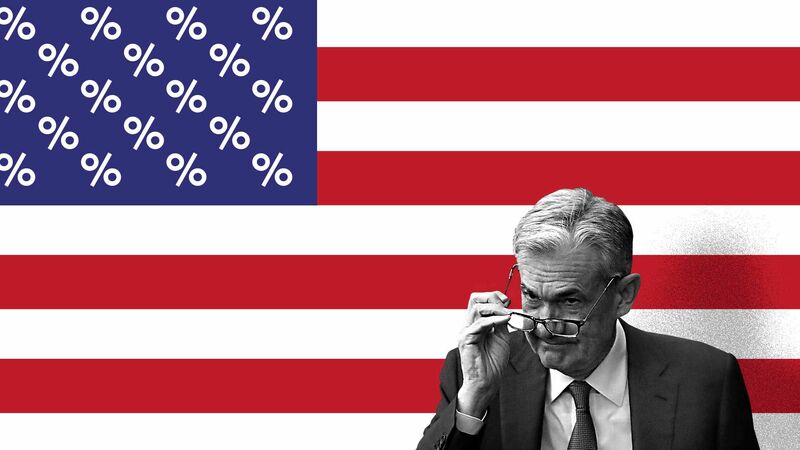 "Powell has figured out that it's in the long-term interest of the Federal Reserve to be better understood by ... the American electorate," Steven Skancke, chief economic advisor at investment firm Keel Point and a former White House and Treasury Department official, tells Axios. "Is that political? Yeah, that's political. Is he being partisan? I don't think so. But it's a political point of view when he says, 'We need to be sensitive to how we are viewed by the constituencies of America,'" he added. The intrigue: Powell is also facing unprecedented pressure from Trump, who looks to have lined the Fed up to take the blame if the economy turns south, as he did when the stock market sold off in December. Investors, too, were leery of the new Fed chief when he was raising rates last year and looked poised to hike the U.S. into a recession, as many market participants believe has been the central bank's wont in the past. But as he's backed off of plans for further hikes, and paring down the central bank's now-less-than $4 trillion balance sheet, a consensus has grown on trading desks that the chairman has done the right thing. Powell "made a mistake in December. And we see what happened," Skancke said. "Why would we otherwise expect the chairman of the Federal Reserve on '60 Minutes' trying to explain himself?" Ed Yardeni, president and chief investment strategist at Yardeni Research, notes that since then, "the 12-month federal budget deficit has ballooned from $681 billion through December 2017 to $914 billion through January 2019." Why it matters: Yardeni argues in a recent note to clients that the yield curve is signaling "weak global economic growth and low inflation without necessarily implying a recession in the U.S."
Bank of America Merrill Lynch's latest fund manager survey shows investors remain down on the global economy, but have found new ways to express their skepticism. What's happening: The most popular trade is shorting European stocks. It's the first time in the survey's history that betting against European equities has topped the list. Last month's top trade, being long emerging market equities, has fallen to fourth, behind long U.S. dollar trades and bets on the FAANG+BAT stocks. "Conviction is low with only 3% separating the first and fourth most crowded trades," BAML's data analytics team said in the report. Allocation to global stocks fell to its lowest since October 2016. Only net 30% of hedge fund investors are long equities, the lowest level since December 2016. A net 25% of those surveyed say they are expecting global growth to weaken. What to watch: The bank's currency analysts tell Axios they are starting to worry about global stagflation. "Although global data is weakening across the board, wages are increasing, which points to inflation risks. What explains both is that labor markets are now tight everywhere. "This suggests capacity constraints, which could explain both slow growth and high wages, leading to stagflation risks. The market is pricing slow growth, but no inflation. The U.K. is the only exception, as the market is pricing both slow growth and inflation." Mozambique has declared a state of emergency after flooding that followed Cyclone Idai. The storm has destroyed an estimated "90%" of Mozambique's fourth-largest city, Beira, which has a population of nearly half a million. So far 1.5 million people have been displaced or otherwise affected by the storm. "African economists fear the scale of devastation will be 'very damaging.' Mozambique is already in default on about $2 billion of external commercial debt," Bloomberg's TicToc reports. The country is currently trying to restructure the debt. Why it matters to the market: The $2 billion default is the result of the almost-too-surreal-to-believe tuna bonds scandal, in which the country's finance minister and supposedly rogue agents from Credit Suisse fleeced Mozambique for at least $200 million in kickbacks and ill-gotten gains, and possibly more than $1 billion. Where it stands: So far at least a dozen people have been charged by Mozambique for crimes like abuse of office, embezzlement and money laundering. The U.S. is seeking to extradite a number of the main parties involved, including Mozambique's former finance minister and representatives from Abu Dhabi-based Privinvest and Credit Suisse. None are yet in U.S. custody, according to recent reporting from the Financial Times. It may not be the age of American oil after all. After we published our story last week on the booming prospects for American oil exploration in the next decade, Anas Alhajji, an oil industry adviser and longtime investor, directed me to an op-ed he'd written for the Financial Times arguing the converse. Why it matters: Alhajji asserts that demand is growing substantially for heavy crude while supply is growing substantially for light crude from U.S. shale, creating a mismatch of supply and demand. The imbalance will choke off the growth of shale and the broader market, leading to an "energy crisis." "We have two problems here," Alhajji tells Axios in a phone conversation. "If you look at U.S. shale forecasts, where will all this light, sweet crude go? We don’t have enough refining capacity worldwide to handle it." "Secondly, we have a mismatch between the quality of oil produced and the products we get out of it." What's happening: The demand for heavy crude is coming from diesel, Alhajji argues, as emerging countries grow their economies and need more fuel for trucks and heavy machinery. That demand will continue to grow. Further, he says, refiners in these countries (and in the U.S.) have invested heavily in refineries that use heavy crude. What's also growing is U.S. shale production, which is expected to eclipse Russia in the next 5 years. But the demand for specialty products made from light crude such as plastics, including straws and bags, is falling. That will keep the demand for shale from keeping pace with the supply, Alhajji says. "Price differentials are going to explode as international prices jump while shale oil prices fall to a price where producers can barely survive." 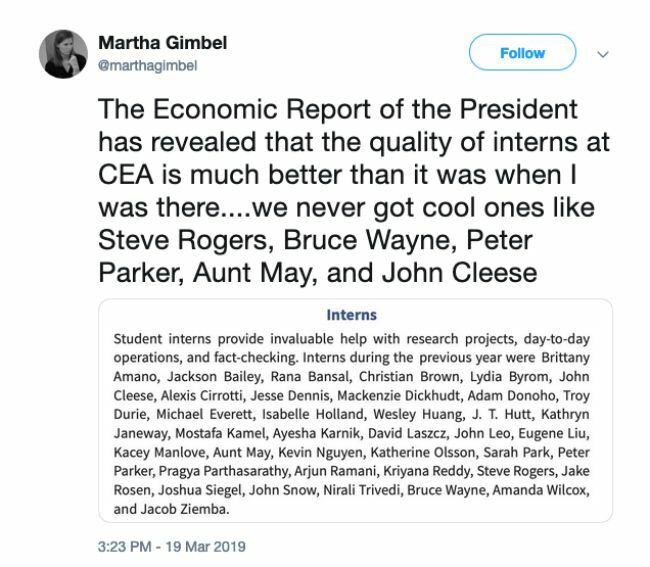 Per the New York Times: "For the second straight year, the group of economists that do regression analyses and forecast annual growth rates for President Trump has slipped a straight-out-of-Comic-Con Easter egg into its annual report."